This summer I traveled from Chicago thru Montana stopping at all the little shops I could find on the way...This has been the BEST shop! Unique, Original, Fun and some are even Practical Gifts! Like it says on our Home page, we literally get new items in everyday! 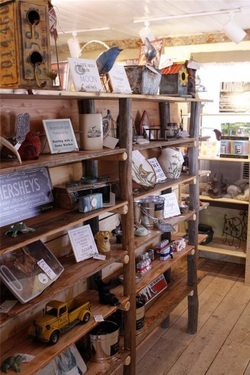 We carry a wonderful selection of Western, Rustic and Cottage Decor. Everything from Bacon Band-aids (and bacon wallets) to Moose Poop (really, don't eat it). Even gorgeous Seiko Clocks! We have a fun selection of amazing color changing T-Shirts, as well as hundreds of Tin signs! Beautiful fence post lamps, really, one of a kind. Exclusive to the Red Shed is the Tile sayings--will not find these anywhere else! They are custom made just for our shop and they are not vinyl lettering either. Funny Sayings to Inspirational Sayings. Local mom crocheting pot holders and dresses, local artist making rag rugs and dish towels too! Our Yard art is so cute and fun, and changes all the time--Sale going on NOW. Too much variety to name everything, but occasionally we also have some antique glassware and vintage art.